Craps is a game of chance and no one can affect the outcome of the game itself and win at craps all the time. Nevertheless, there are certain craps strategies that can increase your winning ratio and help you win at craps more often. It was noticed that successful players share similar ways of playing, including the various online Craps strategies. But it is also true that players, on the other hand (the losing hand), are set in their ways to make the same errors time and time again. In fact, there are no solid craps strategies to tell you how to win at craps as there is in blackjack. We offer a set of rules that will be of help when you play. There is no need to say that you have to have the rules of the game at your fingertips and all information below is given on the assumption that you know all proposition bets as well as rules and payouts. Efficient Craps strategies involve having a good understanding of the smart bets on table. This is a pledge for those who want to win at craps. In Craps the best odds on the table are Pass, Don't Pass, Come, and Don't Come because they give the house the smallest edge. Pass Line Bet yields the house a 1.41% edge. And a Don't Pass Bet gives slightly less than 1.40% to the house. These are the Line Bets and they're the heart of a strategy aimed to win at craps because everything else gives too much away (Look at the section Craps Probabilities). 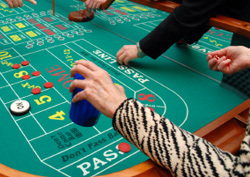 The next recommendation on how to win at craps is the following: during point rolls place the maximum Odds Bets. Odds Bet is a bet which can be added to original Pass Line Bet or your Don't Pass Bet. The bet is absent from the craps layout but wise players are aware of it. The odds are just another bet that point will be established before 7 (or after, if it is a Don’t Pass Line Bet). It is an opportunity to make a bet twice as much as Pass Line bet (Don’t Pass Line Bet). Your Pass Line Bet has odds of 1.41 percent. And whenever you place an additional bet that doesn't have house advantage, you can make the casino advantage on your bet lower. This is one of the most important craps strategies. You had better make sure that you place the right amount of odds bet. Calculate your bet so the payoff is even. If point is set on the 5, and the odds are 3 to 2 against you, your bet should be a multiple of 2. For instance, if you place $10 you will get $15, but if you bet 5$ you will not get 7.5$, the house only pays you in even numbers. Instead you will get only 7$. Please note however that the casinos still have the edge in the long run - regardless of what kind of bets you are making. But despite this fact you can win at craps a handful of money.